Complete list of Alt Code characters for Mangal font typing. Useful for all typing exams for Remington Gail and Inscript Layout. Although this list is valid for both Remington Gail and Inscript Layout. 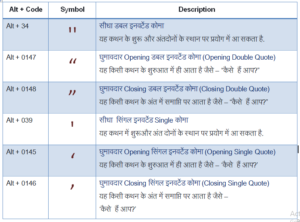 In this post we will learn how to type special characters of Hindi. These special characters are not available on keyboard directly. What is Remington Gail/Inscript Layout? Remington Gail Layout is the easiest and best layout for Hindi mangal font typing. This layout is available for almost all the exams. Unicode mangal font remington gail layout is almost similar to Krutidev/DevLys Hindi typing fonts. There are slight differences those can be understood easily with good practice. Most of the differences lies in the top row ie. numeric row. On the other hand Inscript layout is also available as a choice with mangal font. This is hard to learn and not comfortable for Hindi typing. It is still used by many recruiters like CRPF, CISF, BSF and many more. If you have a choice to choose one layout between these two then you should choose Remington Gail over Inscript layout. Reason is simple Remington Gail is easy to learn and easy to type quickly as compared to Inscript layout. इस पोस्ट में हम मंगल फॉण्ट के रेमिंगटन गेल कीबोर्ड लेआउट से बनने वाले हिंदी की कुछ अक्षरों की जानकारी हांसिल करेंगे. ऐसे अक्षर जो कीबोर्ड पर उपलब्ध नहीं हैं उन अक्षरों को. जो अक्षर कीबोर्ड पर सीधे उपलब्ध नहीं हैं उन्हें बनाने के दो तरीके हैं. कुछ अक्षर एक से अधिक अक्षरों को एक साथ लिखकर बनाये जा सकते हैं. इन्हें हम कॉम्बिनेशनल अक्षर कह सकते हैं. ऐसे अक्षर जो न तो सीधे लिखे जा सकते हैं और ना ही कॉम्बिनेशन से बनायेजा सकते हैं उन्हें हम कीबोर्ड पर Alt की के साथ कोई कोड(संख्या) दबाकर बनाते हैं. कुछ अक्षर कई अक्षरों के समायोजन से बनते हैं. अगर आपको व्याकरण का सामान्य ज्ञान भी है तो आप आसानी से समझ जायेंगे. नीचे दी गयी टेबलों को देखिये और समझने की कोशिश भी कीजिये कि इन अक्षरों को कैसे बनाया गया है. यह बिलकुल आसान है. There are many letters which can not be formed with combinations. Please go through the following table for such letters. 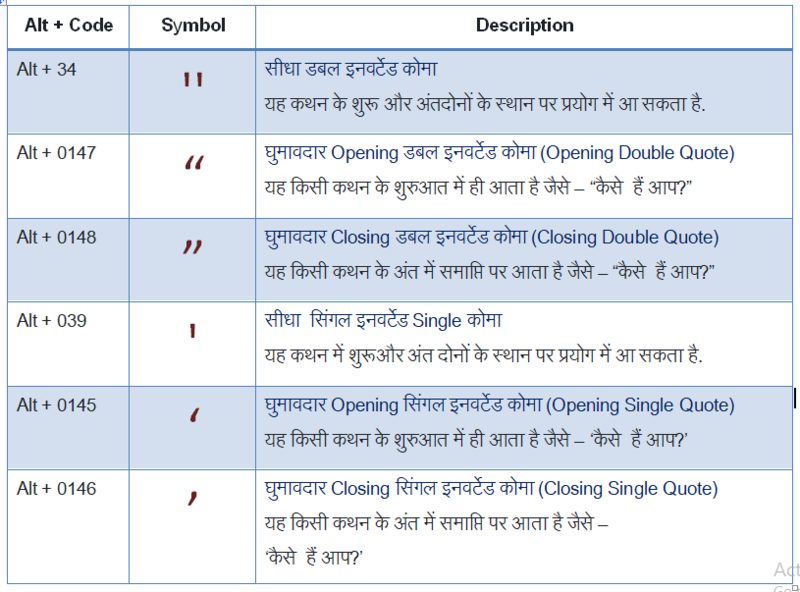 There are Hindi letters which can be formed with either combination or Alt+Code. It is your choice how you type such Hindi letters. The list of Alt+Codes is very long but you should not panic about it. Just read the list and you will observe that only a few characters are of your need. 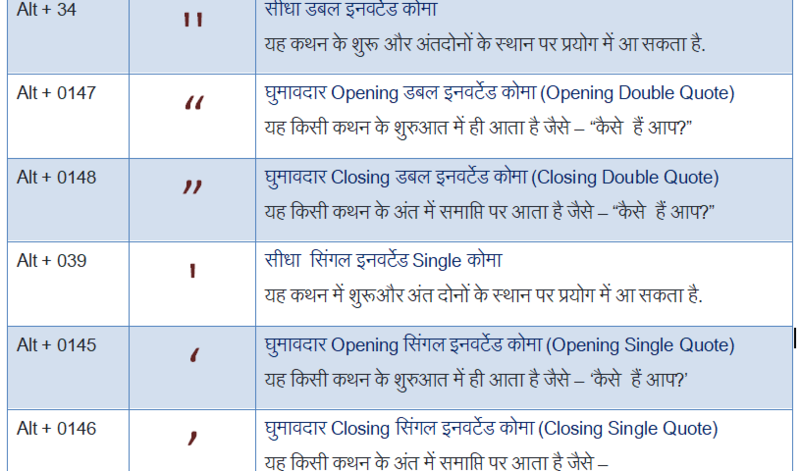 Many special characters are rarely used or either never used in Hindi typing. You will have to learn only about 10 Alt Codes. How to type inverted comma in Mangal Font Hindi Typing? To quote someone’s statement as it in his/her own words we use either single inverted comma or double inverted comma. Mostly people use double inverted comma over single inverted comma. There are many variants of inverted comma available in Mangal font. Look at the following table and see the difference. It is easy to note the difference. Type numbers in Hindi Devanagari script with mangal font? We can type numbers in devanagari script with the help of following Alt + Codes. The list is valid for both Inscript and Remington Layout. The uppermost row on keyboard is called numeric row. There are many Hindi letters which can be found on this row. You don’t need Alt+codes for these letters. These letters can be directly typed with keyboard. Just have a look at the following list.